Virgin Media – Ooh, they didn’t want to ask me this…. Yet more trouble with Virgin Media’s broadband service – and guess what? The poor fools sent me out a customer satisfaction survey!!! Ok, how long do you have? Try having a listen to this..
Basically, scrap the Indian call center – the poor folks there only seem able to stick rigidly to a script and can’t understand when you say something outside it’s list of possible responses. Scrap the premium rate phone number for broadband – The trouble I had getting the charges refunded even when I’d been told by several people they had been – they still turned up on the bill. Get communication with the engineers’ dept sorted out so if an engineer visit is canceled he doesn’t turn up – and then you get charged…. Scrap the 5 pound per month non direct debit fee…it’s blatant profiteering and quite possibly illegal – and yes, I’ve spoken to Ofcom about it and your general failing service. Virgin Media’s customer service has become so poor and seems to be only about how much money it can make for the company…. So, no, I won’t be recommending Virgin Media to my friends – I want to keep them…. The disc box art (as you can probably see on the right) claims this is ‘An Original Movie’. That’s not strictly true. It is certainly original, all new footage. It’s not so much a movie, though. It’s more two separate episodes, the first of which chronologically leads into the second but otherwise is completely unrelated. The box art gives away the main players in the two stories – sorry to spoil you with an image of that but you didn’t expect to be able to buy this DVD without seeing the box, did you?! The two stories are, somewhat curiously, called ‘Over Here’ and ‘Over There’. On the DVD main menu you have the option of watching both (effectively a ‘Play All’ option) by choosing the first option ‘Voices in the Dark’. Alternatively you can select one of the episodes below it. That confused me at first, I chose that first option but the opening credits initially made me think I’d accidentally selected some bonus material! Don’t be fooled first time – that really is the opening credits. Presumably those opening credits will be retained for any future Lost Tales DVDs. It’s basically pictures of the characters from Babylon 5, taken at the time of the original series. They also include Doctor Franklin and G’Kar, who we will clearly, sadly, never see in The Lost Tales (given both Richard Biggs and Andreas Katsulas have died and JMS says he will never recast those roles). It’s a nice montage of the original characters, though a few have been left out (perhaps most notably Ivanova and Lyta). When I’d finished watching the two episodes I went back to the beginning to watch the opening credits again, now knowing for sure that’s what they were! It starts with that music, the caption 2281 and the destruction of B5 :cry:. The years then cycle back to tell you when the stories are actually set, i.e. some years before Sleeping in Light – just in case people are confused by B5 still being around! That short little sequence was enough to make me immediately dig out my B5 Season 5 box set and watch Sleeping in Light – something I’ve only done a couple of times since watching it on TV. The picture quality of Voices in the Dark is excellent. Going back and watching Sleeping in Light straight after really made it apparent just how much better this new DVD image quality is over the series box sets, even the last one. The Lost Tales are being filmed in High Def, so we can be sure to see a HD release of this at some point, in one format or other. We also get full 5.1 audio on this DVD, another win over the Dolby Pro Logic of the original series. All in all it looks and sounds nice. All the familiar ships are there. Babylon 5 looks like the Babylon 5 we all know. They’ve upped the polygons, improved the textures but without direct comparison you might think nothing has changed – memory cheats, this is B5 how you always thought it looked! Perhaps B5 itself was a tad too blue now, a little too shiny maybe, but it looks good. A lot of CGI sets are being used here but nothing new there, they were doing that in the mid 90s in B5, too. Yes, you can still tell it’s CGI in most places but then you can in the likes of the new Doctor Who, too. These aren’t blockbuster film bugets we’re talking about here (and even in some of those you can still tell). Overall a very effective audio visual experience. The sets are few in number and the number of actors are limited too. There’s no B5 C & C, no Zocalo, no central corridor full of humans and aliens. You hardly notice their absence, though. Crucially, it still feels like B5, even without these. The two stories are written with these limitations in mind. They are both quite personal stories, both effectively dealing with three people. The first is the Lochley story and that is very JMS! Lots of questions and leaving it up to the viewer to bring their own answers into it, their own beliefs. The second is a somewhat more conventional story that revolves around Sheridan and Galen. Sheridan’s morality is tested. Dark things lay ahead if he takes the wrong path. There is no doubt this is B5! Neither are stunning episodes in the way that Coming of Shadows, Z’ha’dum, Severed Dreams and the like were. That’s not the point of this B5 anthology series, though. The main B5 story arc is said and done. It was a five year arc. That story didn’t start with the B5 pilot episode though, there is a rich history/back story that informs the series. Likewise it didn’t completely end with Objects at Rest (or Sleeping in Light, for that matter, though I think the anthology series will all be set before that). The events in the B5 5 year arc resonate for, well, millenia – as we saw in The Deconstruction of Falling Stars. This series is a peek at the lives of our characters after those monumentous series events. Nonetheless, you can’t help but get the feeling JMS is already setting us up for a story arc after watching Over There. 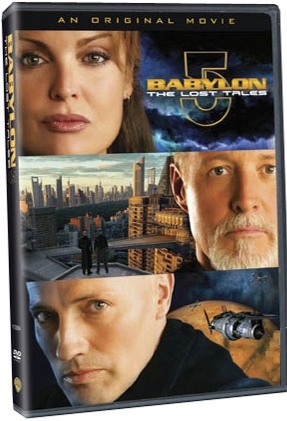 Sales of this new DVD will determine if he has a chance to explore that new arc further in other Lost Tales discs. Personally, again without giving anything away at this stage, I really enjoyed them. Yes, they are basically character pieces. Anyone expecting great space battles, the telepath war or a major piece of information that puts the entire series in a new light will be a bit disappointed. That was inevitable. Some of these may come. There are hints about making a DVD of the telepath war a few discs in. If budgets grow, who knows what we might see. If you enjoy the way JMS thinks, then you’ll like this new disc. If you miss B5 then you’ll almost certainly like this disc. If Galen makes you laugh then you’re certainly like this disc! The cast in general do a great job, especially Boxleitner and Woodward – you can tell they are enjoying being back! The extras are pretty good, too. Sadly no commentary. A fair bit of behind the scenes bits, including short interviews with the three primary cast members and JMS. JMS answers a lot of questions about the production and even shows us his original concept for The Lost Tales – sadly rejected by Warner Brothers! There’s also quite a moving memorial to Andreas Katsulas and Richard Biggs, whose characters are also mentioned specifically in the story. All in all it’s quite a gentle start back into the B5 universe. It’s great to be back there again and I recommend it to all B5 fans, especially at the good price of £8.99 you can easily find it for online. There was always two sides to B5 – the epic and the personal. This disc distinctly goes down the personal story route but with temptations into the epic, if we are lucky enough to be able to continue this journey.